Gravity Gunmen is a work-in-progress gravity based shooter/fighter. 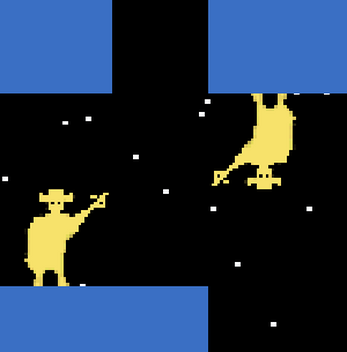 Think of Smash Bros. meets Atari graphics, meets cowboys, meets gravity shifting power, meets shaky cam. The Game is fast paced. For now, just try to knock your opponent off the map, or break the map around them. Last one standing, wins.